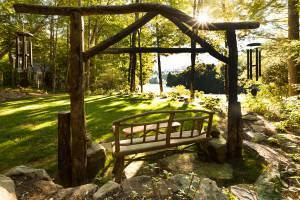 Starting on Tricky Places : Gardens that Fit Your Lifestyle like a Glove. Whew. Its taken a summer like 2016 when friends and family had calamities, passed away or got really sick to make me appreciate my garden and health even more… and then the specter of scary local fires burning thousands of acres in our treasured Smoky Mountains which made me appreciate our fragile ecosystem. 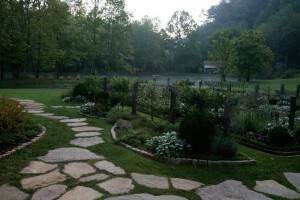 This blog is a personal note is to myself to review everything in Dargan Landscape Architects book of work to help my friends, their home environments and interface with nature. Like holding hands with fragile yet resilient gloves that fit perfectly. 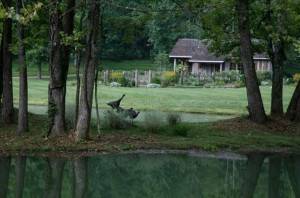 Hugh and I have been in practice as landscape architects for over four decades. Our client’s now lovely landscapes were tricky places to make behave: with thin soils, complicated topography, owners large wish list, zoning issues, too much or too little shade, too much or too little water, not enough space, too vast a canvas, weird parking, insufficient walkways…the list goes on! We are blessed with the honor to coax, bend and collaborate with the owners to get the best designs built, and we thank them for sharing their private worlds. My goal is to inspire homeowners to get the best out of their precious home environment. Design it to yield healthy wellbeing, inspire you to be your best and to provide nurturing spaces. 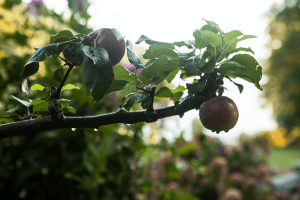 Once we finish this work together, your garden will function like a well-oiled machine, which in itself is a stress-reducing factor. 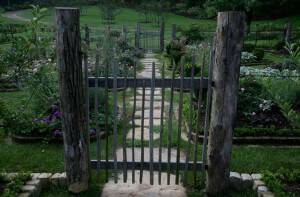 Photographer, Sarah Valentine of Highlands NC, shot beautiful dawn shots and late summer portraits of many of our local gardens. Stay tuned as the book progresses! The prospect of saying yes…not a decision taken lightly. The invitation extended to chair the Jan Wyatt Symposium 2017 for the Cashiers Historical Society, by Ann McKee Austin ( from whom it is impossible to decline a volunteer invitation) and president, Connie Haire, was a surprise. Do I shoot myself after saying yes? NO. I’d promised my family not to take on more projects. But the tantalizing nudge to dust off a topic thoroughly covered in my first draft masters thesis is 1977 is impossible to resist. Rafts of info laying fallow in the storage unit, mildewed and unloved, has been slowly maturing…waiting for airtime. One does not lightly throw something together that could impact a visitors perspective of history. On the suggestion of Macon County Librarian,Karen Hawks, a spin and TRX buddy, I hired the wonderful librarian, Emily Crowell, to type, type, type. YIKES! The old manuscript was a dot matrix printed, accordian-paged, non-digital manuscript. Emily DOVE IN with glee on her day off from work and is quickly modernizing the document. 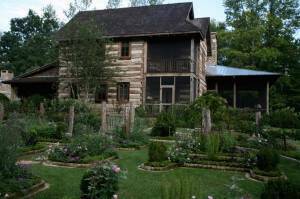 WE HAVE A TITLE: The 2017 Jan Wyatt Symposium The Heirloom Gardener hosted by The Cashiers Historical Society. WE HAVE A LOCATION: The Zachary Tolbert House Grounds c 1850. WE SET A DATE: June 21 2017. And me, to demonstrate what a garden might have looked like in 1850 when Alexander Zachary built the house in Cashiers, NC. WE HAVE A STORYLINE and I meet with the tent man next week. Whew…stay tuned for schedule and logo next! How cute is this? We just got an e-mail from a client with the above attached. Is it safe to assume this cat’s afternoon is going purrrfectly? We love receiving photos from our happy customers. Don’t hesitate to get in touch and share your pics with us- whether it’s you with one of our books or a pet friend. 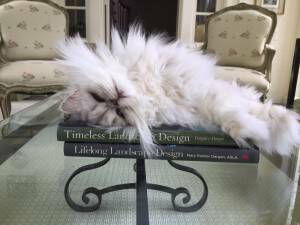 Find out more about the two books this furry friend is relaxing on: Lifelong Landscape Design and Timeless Landscape Design.